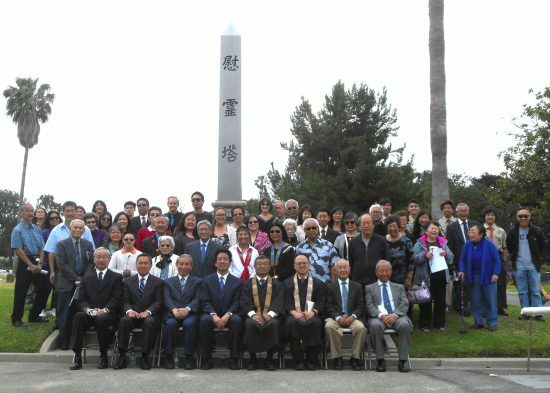 The 57th annual Memorial Day service at Woodlawn Cemetery in Santa Monica was held by the Venice Japanese Community Center, Santa Monica Nikkeijin Kai and West Los Angeles Japanese Institute of Sawtelle. The program in front of the ireito (memorial tower dedicated to the area’s Issei pioneers and Nisei soldiers) included presentation of colors by Boy Scout Troop 764, floral and incense offerings by organizational representatives, and religious services conducted by Rev. 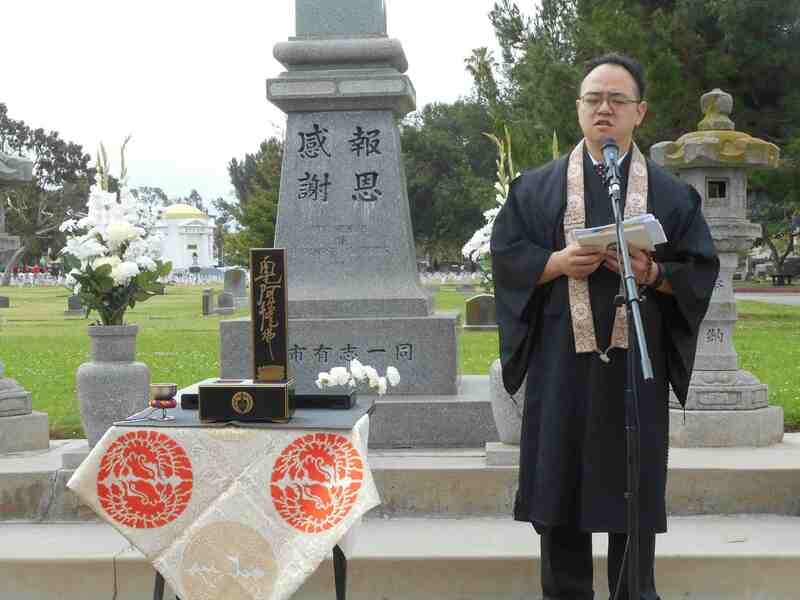 Kory Quon (pictured below) of Venice Hongwanji Buddhist Temple, Rev. James Miyabe of Venice Free Methodist Church, Rev. Brian Nakamura and Rev. Takashi Furuyama of West L.A. Holiness Church, Rev. Gary Oba of West L.A. United Methodist Church, and Rev. Fumiaki Usuki of West L.A. Buddhist Temple. Master of ceremonies was Wesley Shimoda of Venice Japanese Community Center. Floral and incense offerings were made by organizational representatives: Jimmy Fukuhara, Santa Monica Nikkeijin Kai; Emiliy Kariya, Venice Hongwanji Buddhist Temple; Phyllis Hayashibara, Venice Hongwanji Buddhist Women’s Association; Kuni Nishiya, Venice Japanese Community Center; Dr. David Fong, Venice Free Methodist Church; Connie Yahata, West L.A. Buddhist Temple; Beverly Yahata, West L.A. Buddhist Women’s Association; Isao Ikehara, West L.A. Holiness Church; Judy Okita, West L.A. Japanese American Community Center; Sue Takahashi, West L.A. United Methodist Church.